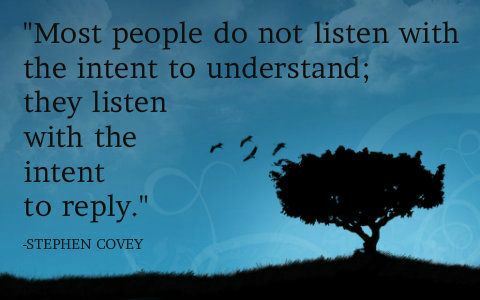 Stephen Covey is said to have communicated the following concept: “Most people do not listen with the intent to understand; they listen with the intent to reply.” In my opinion, truer words were never spoken. Effective listening is a skill to develop where the listener is truly doing so with the intent to understand what is being conveyed. In the life of a family dealing with addiction, effective listening is one of the more important skills that we can use to help us to communicate effectively with our loved one and with each other. As many of you know, I am a Balm© Family Recovery Life Coach, but before beginning my coaching career, I was a family member with an addicted loved one who attended the BALM© Comprehensive Family Program. One of the most important skills I learned as a family member of an addicted loved one and continue to hone as a coach is the value of effective listening to the communication between the family and the addict. ion level with the addict. In subjective listening, we can’t wait to share our thoughts. We already know what we want to say before the other person has even completed his or her thought. When we do this, there is a good chance that we will be missing much of what the other person is saying and there may be important pieces of information communicated to us that fly right over our heads. The important skill in this situation is to learn to not think about what we want to say until after the other person has finished talking. Objective listening occurs when we put ourselves aside and focus on what our loved one is saying to us. We listen to hear their point of view. One of the biggest problems we run into when listening to other people is the possibility of too many distractions. The key is to give full attention to the other person and the conversation. This means putting away the mobile phone and turning off the headphones or television. Think about how it feels to be trying to convey an important piece of information to another person, and they are half listening to you and half looking at something on their computer. How does that make you feel? How effective is that listening? It seems that many of us have become obsessed with multitasking — it is NEVER a good idea to multitask. In fact, multitasking while listening to someone speak is rude. Intuitive thinking is a highly skilled form of listening. It involves listening to not only what is being said but also on the tone of voice being used and the body language employed by both the speaker. In fact, it is a valuable skill to be able to recognize our own body language so we know what kind of non-verbal message we are sending as well. There are many valuable tools we can learn to use to strengthen our ability to communicate with others including our addicted loved ones. It is important for us to remember that we love them and hate the addiction. If we can learn effective listening skills we are making a concerted effort to reach them where they are as well as try to guide them to effective means for changing their current path. If all we do is nag, complain, plead and yell, and never listen to what they are saying, we shut down that very valuable level of communication, which might be the very avenue to help them find their way back. Reflecting our loved one’s words is a relatively easy way to engage in effective listening. First, it allows us to show we have heard what they are saying. Feeling that you are being heard is such a powerful emotion. It readily leads to further communication. It is also a way for us to be certain that what we think we heard is actually what was said. Briefly clarifying what our loved one has just said can be very beneficial to avoid any confusion. After our loved one has spoken fully, we might respond with something like, “I think this is what I heard you say. Please let me know if I have understood you.” This lets them know that we have been listening and it also lets them tell us if we misunderstood. Then we can reflect again to assure we are on the same wavelength. But this is only one tool. As I stated earlier, it is very important to staying quiet and hear what is said without planning what we will say in response. Most of us have this instinct to anticipate what the other party to the conversation will say and so it is very hard to do. However, the benefit of listening carefully and then pausing before responding cannot be overstated. It is a good practice to silently count to 10 after our loved one stops talking. Since we have not been planning our response in advance, this allows us time to collect our thoughts and consider a response. This shows our loved one that we have valued what they have said and that we were in fact listening to what they had to say rather than just waiting for our chance to speak. Another issue that we often have is staying in the moment without thinking about other things. Learning a meditation technique will teach us not to be distracted by other things happening around us or even by our own thoughts. Many of us are afraid of silence in a conversation and feel the need to chatter just to avoid silence. There is no need to fill silence with words unless there is a real purpose. Mindfulness meditation is a powerful tool that allows people to become better listeners. It involves being fully present in the moment and accepting what is happening – two attributes of an effective listener. There are many good books available dealing with mindfulness meditation and there are YouTube videos on the topic as well. For those new to meditation, there are very short practices. We can’t expect to meditate for long periods of time if we have never done so. So we start small…2 or 3 minutes…until we can focus for longer. Meditation will make your listening skills more effective and your overall communication much more powerful. Reading tone and body language are very valuable skills to hone for effective listening. Some experts have said that more than half of what is being communicated comes through tone and body language, rather than the words being spoken. We don’t focus on these things to call out our loved one. Rather we do this to make us more aware of what is happening and take our listening and communication to a higher level. There are many books and articles that share many examples of body language. For example: most experts say that if the speaker looks to the left they are trying to remember something while looking to the right is an indication of a lie or a manufactured version of the truth. An example of what tone can tell us is when speaking deceptively, a person tends to speak at a higher tone than normal. Of course, effective listening is only one component of the communication process. By working with a coach and/or attending a program like the BALM© Comprehensive Program, we can learn all of the important skills be our loved ones best chance at recovery rather than their best chance at relapse. In light of this it is Important to remember that in order to help our loved one by using effective listening, we must first accept them where they are, letting go of unreasonable expectations regarding where they will go. Instead we must develop strong communications by listening intently and thereafter we can begin the process of encouraging change. Bottom-line foundational coaching skills at their best, Jackie. Yes, this applies to just about any relationship you can think of. It takes a lot of self-awareness, and the payoff is priceless. And you find that the person in front of you softens a bit, and becomes a more attentive listener to you, too. It’s a win-win. Appreciate your sharing this with us. I have learned through experience not to project my thoughts and opinions by just listening and then asking if the person wants feedback or just a listening ear. It’s not easy to bite your tongue with silence. I thought the looking to the right is honesty and left the other way around. Excellent articulation of what we need to hear. – Pun intended. Thank you, Jackie. It is always good to be reminded of these skills.